Rakhi gift basket is a wonderful thing to give on Raksha Bandhan or Rakhi festival. Rakhi gift baskets include Rakhi thread, sweets, idol of Lord Ganesha, etc. 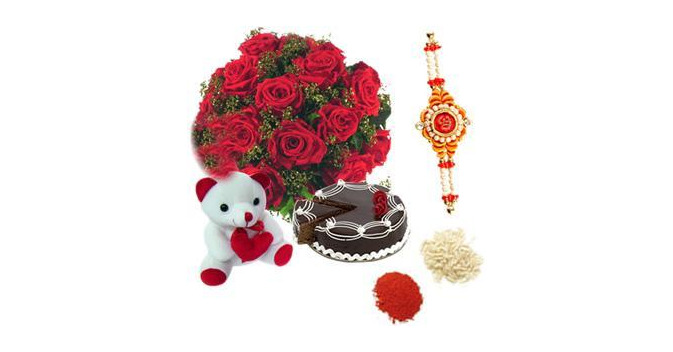 Different types of Rakhi gift basket contain different items. Rakhi is a festival to strengthen the bone between brother and sister. On this wonderful occasion of Rakhi your siblings need some special gift. So, it would be wonderful to give a Rakhi gift basket. Here is a list of some wonderful Rakhi gift basket. This type of gift basket contains sweets and chocolates. Sweets are always a part of all Indian festivals. Feeding each other with delicious sweets has been a tradition of Rakhi festival. As soon as the festival of Rakhi draws nearer stores are flooded with yummy sweets. They are wonderful to give on the occasion of Rakhi. Keep in mind the taste and choice of your sibling and fill the basket with some delightful delicacies. This gift basket is a best option to convey your deepest feelings to your siblings. On of the most beautiful gifts it can bring the real mood of celebration. One can get various types of designer flower baskets in the market.